I want to use my Pi as an XBMC server in the car. The XBMC docs say that you should always use the shutdown command before disconnecting the power. 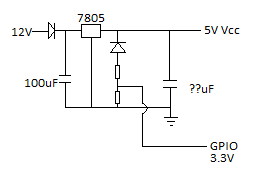 I've been thinking that it should be possible to create a simple circuit with a capacitor and probably a diode to detect when the power supply was disconnected (and raise an interrupt on one of the GPIO pins) but the capacitor would provide current long enough for the system to shut down properly. Does this look correct and sufficient? What kind of capacitor would I need to store enough charge to keep the Pi going long enough for XBMC to shut down properly? For the record, this question was also asked on SE Electrical Engineering. The best solution on my opinion is to use the UPS Pico , a specially designed for Raspberry Pi UPS, that offer a plenty of other features. It is low cost, includes battery, no need for any extra cable, just put it on top of RPi. Running on a car, and automatic shutdown, also running on XBMC. Comparator's output goes to GPIO pin (in this circuit there is placed multimeter instead) so that Raspberry could check if car's ignition is still on. Everything else is explained by the previous speaker. "S2" is a reset buttun - just in case. In the picture you can see XMH4, XMM1,.. Don't care about it. I've used it only to check interesting parameters while testing circuit in Multisim. My only question is reaction to rising temperature. Perhaps, there will be need to change the values of resistors in voltage dividers. Edit: I've realised that in spite of the fact that the cirucit is surely correct in the theory, it is useless. Cost of such a big capacitor (1F, 12V) is unacceptabe high. Another solution might be connecting voltage regulatior stright to acculumator and using voltage comparator between car's ignition and the battery. 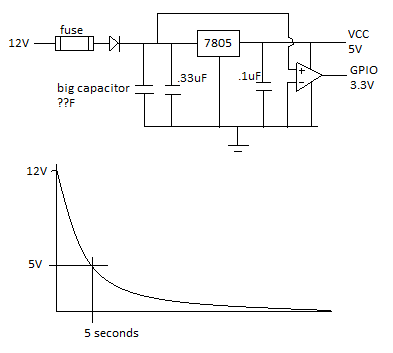 It may be possible to design a suitable circuit with a set of "super-capacitors" batteryuniversity.com article & Wikipedia entry and something like what you get from an on-line auction site if your search for a "3V to 5V 1A DC-DC Boost Converter" - you would another (say 5-25V in to 5V 2A(?) output Buck-Boost") converter to drop the 12V (well 13.8V) Car Supply to the 3 to 5 Volts needed to keep the capacitors charged - then the first converter uses that to power the Pi. You would also need some inrush prevention in the circuit as the super-caps will take a large surge current (from the 12V converter) when voltage is applied to them and they are discharged. Keep it simple and prove your project is worth the effort of a UPS. Just add a momentary switch to short a couple of GPIOs that triggers a shutdown. The Pi will power up when the car is started next time. Be wary your supply is only delivered after the engine has started, to prevent a dip during the ignition process. Connect a wire to pin 11 and a wire to a Gnd pin. I'm not sure how well Kodi plays with GPIO switches so it may have to be within Raspbian. Not the answer you're looking for? Browse other questions tagged gpio power-supply kodi electronics or ask your own question. How do I turn on my Raspberry Pi after shutdown? Is an external pull-up/down circuit mandatory for GPIO pins?